Sometimes when kids get it wrong, they get it right! 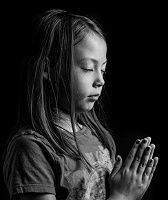 Kids are wonderful for their insights into God, faith, and spiritual life. These insights can lead us as adults to take another look at what we say or believe. I have observed that their insights can often stem from misunderstanding something — such as singing the song: "Up from the grave He arose," substituting the words "gravy a rose" for the phrase "grave He arose." I enjoyed the insight from the following story from one father. When my daughter said her bedtime prayers, she would bless every family member, every friend, and every animal (current and past). For several weeks, after we had finished the nightly prayer, Kelli would say, "And all girls." This soon became part of her nightly routine, to include this closing. My curiosity got the best of me and I asked her, "Kelli, why do you always add the part about all girls?" Her response, "Because everybody always finishes their prayers by saying 'All Men'!" To a child, I can understand where the misunderstanding might arise. Perhaps "Amen" might sound like "all men" to her, as if only a certain segment of our society can be saved. Sometimes we have the tendency to focus on people "just like us"! These folks "just like us" become our sharing the Gospel focus. In a way that is understandable, it is human nature to gravitate to people with whom you have a common bond or share similar backgrounds. However, God doesn't give us the luxury of picking and choosing folks "we like" for salvation. Ending a prayer with "In Jesus' name, all men!" or "In Jesus' name, all girls!" may not be strictly according to the pattern we have learned, but I say, "Amen anyway!" — which basically means, "let it be so, anyway!" * That's why the NLT uses the term "everyone" and the NIV "all people" instead of the gender specific "all men." "'In Jesus' Name, All Girls!'" by Russ Lawson is licensed under a Creative Commons License. Heartlight encourages you to share this material with others in church bulletins, personal emails, and other non-commercial uses. Please see our Usage Guidelines for more information.